Our selection is the prize of Jaime Munoz, winemaker extraordinaire. Jaime has globetrotted extensively, crafting incredible wines from several different continents, and adding his signature style to each one. For this gem, we go to the Maule Valley at the southern tip of Chile, the coolest growing district in the country. The cool climate allows the grapes to rest on the vines, pulling the needed nutrients from the soil and making Maule Valley wine of full extraction and flavor. The grapes were picked from the finest vineyard in Maule, Antawara, to create this exciting offering. Chile has been an important wine-producing country since the Spanish colonized it over 500 years ago. They brought their vine and wine culture, and the Chileans took from there. It wasn't until the 1990s that important players from France and the U. S. realized there was something special here and began investing heavily. The results are in wines like our Hermoso Hermosa wine. This Merlot/Cabernet Sauvignon blend could be confused with Bordeaux until you get to the price. Then all bets are off. The value you get for the price of this wine is nothing short of incredible. Here is a beautifully crafted, exquisite red wine selection, reflective of all the care that went into its making. 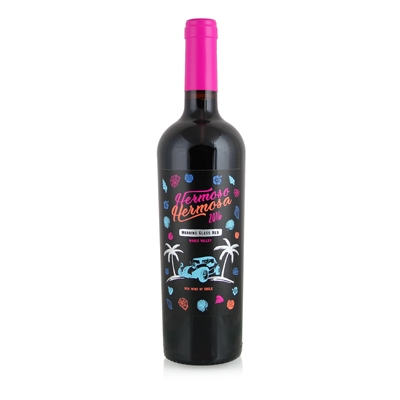 Ripe flavors of plum, anise and berry are matched with soft tannins that ease the rich, extracted finish.